Grand Master Ramon Perellos y Roccaful donated a set of tapestries as his ‘gioia’ to the then Conventual Church of the Hospitallier Order of the Knights of St John the Baptist. Ths Spanish Infanta Isabella’s taste for exuberance influenced his choice most and like her he dedicated this enormous set of tapestries to the Triumph of the Eucharist. This set was a completely original Catholic Reformation graphic narrative conceived by Peter Paul Rubens in consultation with the Infanta. 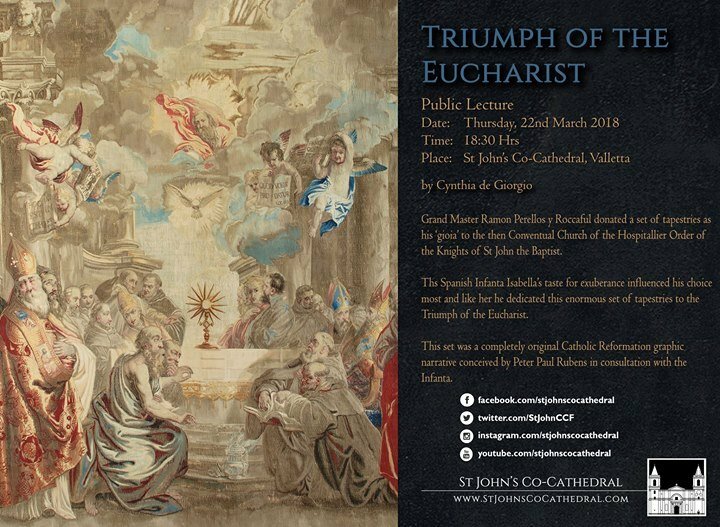 The Lecture will be held in the main nave and seating is on a first come first served basis. You are kindly requested to be seated by 18:15 Hrs. Guests are kindly requested to refrain from wearing stiletto/narrow heels.